We’d love your help. 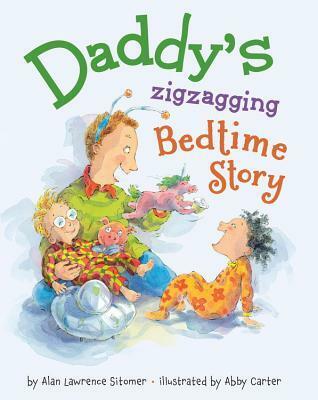 Let us know what’s wrong with this preview of Daddy's Zigzagging Bedtime Story by Alan Sitomer. To ask other readers questions about Daddy's Zigzagging Bedtime Story, please sign up. 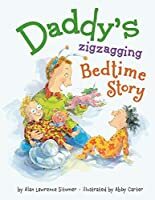 Daddy's Zigzagging Bedtime story does a couple things I really like: 1- captures a very real parenting moment: how to make everyone happy, 2- a dad reading to his kids!, 3- it's totally silly, making for fun conversations. But one thing I didn't like was how the "girl" and "boy" parts of the story were so generic. This is the type of story parents come up with when they have a princess loving daughter and an alien loving son. Funny! Cleanliness: mentions fairy tale magic, unicorns and burping. The kids complain at the beginning of the story. **Like my reviews? I also have hundreds of detailed reports that I offer too. These reports give a complete break-down of everything in the book, so you'll know just how clean it is or isn't. I also have Clean Guides (downloadable PDFs) which enable you to cl This is the type of story parents come up with when they have a princess loving daughter and an alien loving son. Funny! It's bedtime, and time for a story to help Jake and Jenny drift off to slumber land. But when they turn every storybook down, it's time for dad to take matters into his own hands. Truck driving princesses, space aliens, and unicorns all combine to make this bedtime story one of the best Jake and Jenny has ever heard. I even laughed when I read this! Made-up bedtime stories are for sure the best ones! I knew I was in for a wild ride when the book’s front matter mentioned a truck-driving princess, evil space aliens of doom (who burp fire), cupcake-making unicorns and kung-fu pigs. Any parent who’s read to their kids can appreciate the dad’s predicament of trying to select a bedtime story that will please both his kids. The dad creatively crafts a story on the spot from disparate parts, a literary Frankenstein’s monster, to please the very different reading requirements of a young boy and a you I knew I was in for a wild ride when the book’s front matter mentioned a truck-driving princess, evil space aliens of doom (who burp fire), cupcake-making unicorns and kung-fu pigs. Any parent who’s read to their kids can appreciate the dad’s predicament of trying to select a bedtime story that will please both his kids. The dad creatively crafts a story on the spot from disparate parts, a literary Frankenstein’s monster, to please the very different reading requirements of a young boy and a young girl. I would have liked for the kids to be the protagonists rather than the dad. As it is, the kids don’t learn or grow, nor do they overcome any challenges themselves, so there’s no lesson for young readers. In fact, the book feels aimed more at adult readers in that sense. The book clearly conveys the love a father feels for his two kids with a wacky but light touch. And I was charmed by “pickle quackers” as a term of endearment. The watercolor illustrations were absolutely lovely. I laughed out loud at the one showing the wide-eyed kids at the conclusion of the storytelling. This book is super cute, and has become one of my new favorites. I love the small humor throughout, and how it is easy to distinguish the different characters as I read along. I think students would certainly enjoy this book because it is also super easy to relate to. Such a fun read, can't wait to share it with my future students. This was like Fortunately, the Milk distilled into a picture book. Match with Once Upon a Cool Motorcycle Dude and Once Upon a Royal Superbabyby Kevin O'Malley. I found myself caught up in this cute story! I hung on every word and page as Mr. Sitomer took us through a story geared to engage a storyteller's toughest critics--his or her own children. It is bedtime, and Jake wants one book; Jenny wants another. Jake wants one kind of story; Jenny wants another altogether. Never fear, Dad is here, with a story unlike any his kids have ever heard. Daddy's bedtime story combines the interests of his little girl with his young boy in a way only a pretty decent storyteller can do. His excitement at his own tale is endearing. The illustrations manage to capture dad and his children in addition to the fantasy-laden bedtime story. A fun story about a dad trying to please both his son and his daughter as he makes up a bedtime story, zigzagging through the story between what the boy likes and what the girl likes. I want to try it as a preschool storytime book and hopefully the kids will enjoy it as much as I did! Cute and inventive. Hopefully it will inspire parents to create interesting stories of their own for their kids. This was a great book to read out loud - especially if you have children who like their stories on opposite ends of a spectrum. This was a super cute book and my daughter loved it!! Good for asking, what do you think will happen next. This bedtime story has everything in it, like a monster truck-driving princess who battles aliens with her cupcake-baking unicorn sidekick! AWESOME! When I review a kids book it's because I either loved it or hated it. This one was sooooo cute and I suggest everyone read it!! this sounded like one of my turning pages stories! I tend to go over the top when I'm reading to my kids. Especially when it's a silly story that I'm having fun with. My kids both LOVED this one. I highly recommend for your little ones too! Cute! Great example of making up a bedtime story. Also love the line "I wish Mommy had no friends so she could be home tonight instead of out to dinner." Really enjoyed reading this to my son, as did my husband. A very engaging story, easy to get into and has fun illustrations.